Autism Spectrum Disorder (ASD) includes autistic disorder, Asperger syndrome, Rett syndrome, childhood disintegrative disorder, and pervasive developmental disorder not otherwise specified. Studies indicate that the prevalence of these neurodevelopmental disabilities, which cause significant problems with social interaction and communication, is increasing. Researchers believe genes, brain dysfunction, and environmental factors play a role in causing ASD. Although there is no cure, early diagnosis and evidence-based interventions currently provide the best long-term outcomes. 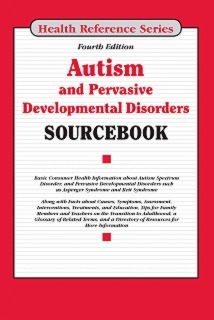 Autism and Pervasive Developmental Disorders Sourcebook, Fourth Edition provides updated information about the specific types of autism spectrum disorders. It explains symptoms, assessment, and diagnosis of ASD and describes the importance of early interventions. Evidence-based behavior, communication, and biomedical interventions are presented, along with educational guidelines for teachers and parents of children with ASD. Support, safety, transition, mental health, and employment information for families and individuals affected by ASD is also provided and it concludes with a glossary of related terms and a directory of resources offer additional help and information. This book is divided into parts and chapters where parts focus on broad areas of interest and chapters are devoted to single topics within a part. Part One: Overview of Autism Spectrum Disorder (ASD) describes autistic disorder, Asperger syndrome, Rett syndrome, childhood disintegrative disorder, and pervasive developmental disorder not otherwise specified. A separate chapter reviews the increasing prevalence and the diagnoses made for autism spectrum disorders in the United States. Part Two: Causes and Risk Factors Associated with Autism Spectrum Disorder reviews neurodevelopment disorders, brain dysfunction, prenatal inflammation and autism risk, and presents current research about the many genes linked to ASD. Risk factors for ASD—including diseases, vaccines, premature birth, and early development risk factors for autism spectrum disorder are discussed. Part Three: Identifying and Diagnosing Autism Spectrum Disorders describes the range of symptoms and developmental milestones and delays that indicate a need for further assessment of autism spectrum disorders. Developmental screening, medical and genetic tests, and other assessments are explained. The part also talks about speech and language development in children, and measuring autistic intelligence. A separate chapter reviews options for moving forward after receiving an ASD diagnosis. Part Four: Conditions That May Accompany Autism Spectrum Disorders provides information about communication difficulties, non-verbal learning disability, seizures, and epilepsy. Genetic disorders that co-occur with ASD—such as Angelman syndrome, fragile X syndrome, Landau-Kleffner syndrome, and Prader-Willi syndrome—are also explained. The part also talks about conditions that may occur with autism spectrum disorder such as thin bones and high growth hormone in boys. Part Five: Interventions and Treatments for Autism Spectrum Disorder gives detailed information about practices that are often effective for individuals with autism spectrum disorder (ASD). Topics include early intervention for children with developmental delays and interventions for individuals with Asperger syndrome. Communication and behavior therapies such as applied behavior analysis, verbal therapy, and pivotal response treatment are described. Medical treatments, research study participation, communication therapies, and ASD medications are also discussed. Part Six: Education and Autism Spectrum Disorder describes the special education process and offers tips for teaching students with autism spectrum disorder (ASD), managing challenging ASD behavior, and promoting social interaction. Separate chapters address secondary school experiences, preparing ASD students for postsecondary education, and teaching lifetime goals. Part Seven: Living with Autism Spectrum Disorder and Transitioning to Adulthood provides practical information about safety and support for autism spectrum disorders adults focusing on specific concerns such as depression and toilet training. The also offers facts about explains how living arrangements, oral care, transition plans, finding housing, career planning, and job accommodations for adults in the autism spectrum. Part Eight: Additional Help and Information provides a glossary of terms related to autism spectrum disorders. A directory of organizations with additional information about autism spectrum disorders is also included.